Internationally acclaimed pastry chef Alain Roby of Geneva’s All Chocolate Kitchen is raising awareness for St. Jude’s Children’s Research Hospital with his third annual Ooh La La Chocolate 5k. The run will wind through the streets of stunning downtown Geneva and end at the world famous All Chocolate Kitchen (A.C.K) 33 South Third Street. Runners will be met at the finish line with a custom finisher medal, an All Chocolate Kitchen sweatshirt, and a chocolate experience provided by Chef Roby himself. The event will take place on Sunday, November 5th at 7:30 a.m. Registration is available online at https://oohlalachocolate5k.itsyourrace.com/register/. Running or walking the 5k will be a $40 registration fee for each participant. At 6:00 am, registration will open at the starting location, at the Kane County Court House, 100 S. Third Street in Geneva. Chef Alain Roby of the All Chocolate Kitchen was named the 2013 Pastry Chef of the Year by the Chicago Culinary Museum. As an award-winner, Roby was recently inducted into their Chef Hall of Fame. A Certified Master Chef of Pastry and Sugar Artistry, and Hall of Fame member in both Pastry Art & Design and Chocolatier magazines, Chef Roby is internationally known for his talent in creating sugar and chocolate masterpieces. He is the only pastry chef to hold three Guinness World Records for his creations of the World’s Tallest Cooked Sugar Building, the World’s Tallest Chocolate Sculpture, and the World’s Longest Candy Cane. His award-winning cooked sugar building was 12 feet, 10 inches tall, his chocolate sculpture was 20 feet, 8 inches tall, and his candy cane was 51 feet long. Chef Roby studied and learned his culinary art in Paris from the world famous Pastry Chef Lenotre. His work has been featured in Food & Wine, Gourmet, Architectural Digest, Traditional Home and Veranda as well as on The Learning Channel and Food Network’s Extreme Pastry and Sugar Rushshows. He has been highlighted on three Food Network specials: Unwrapped with Mark Summers, Mystery Birthday Cakes, and The World’s Tallest Sugar Building. Chef Roby has served as a celebrity chef for the Celebrity Chef Tour in Chicago and has been the head pastry chef at the NFL Commissioner’s Super Bowl Party for the past 19 years. Before opening A.C.K., Chef Roby worked as the Corporate Executive Pastry Chef for a major hotel corporation for 24 years. He is the author of the cookbook,“Alain Roby’s American Classics: Casual and Elegant Desserts,” an editor’s “Top Ten” pick by The Food Channel. A destination to indulge in and relax, A.C.K.’s unique decorations ornamenting the interior is a tribute to Chef Roby’s award winning chocolate creations. The walls of A.C.K. are adorned with photos of Chef Roby’s award winning events, down to the exact shoes that Chef wears as he works on each. A.C.K. guests have complimentary access to Chef Roby’s famous chocolate creations, including a 23-foot-tall all chocolate enchanted tree, made entirely out of Dark Belgian Chocolate; a retired 700 lb. sculpture of Neil Armstrong in an astronaut suit, created out of white chocolate for the Adler Planetarium that was featured on the Food Network and the Learning Channel; and finally, a life-size, 650 lb. white chocolate Blackhawks player, honoring Chicago native/former NHL player Eddie Olczyk, presented to him at the Blackhawks’ celebration of the 2010 Stanley Cup. A.C.K. is located at 33 South Third Street in beautiful downtown Geneva, Illinois. 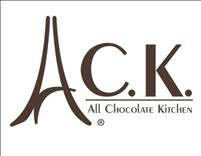 Hours are Monday through Thursday from 9 a.m. until 9 p.m.; Saturday from 9 a.m. until 10 p.m. and Sunday from 11 a.m. until 6 p.m. For more information, visit www.AllChocolateKitchen.com or call 630.232.2395.